The state of Kerala has been witnessing politics that is unique. Two coalition blocks, namely the United Democratic Front (UDF) led by Congress and the Left Democratic Front (LDF) led by left, have been ruling the state through coalitions alternately, since decades. This was only major state in India to buck the saffron wave in 2014 Lok Sabha elections that also provided solace to the secular brigade of our country’s political spectrum. The God’s own country, also showcases the darker side of secularism in India. The first democratically elected Communist government in the world was formed in Kerala. EMS Namboodiripad, a Kerala Brahmin, is credited for it, who orchestrated proliferation of beef in the state to show solidarity to the Muslims. Mallapuram district was carved out in this state of Kerala to drench the drought of seculars here, as it’s an offshoot of the Saudi kingdom, where governance is strictly determined by Islamic rules. The absurdity and the barbaric nature of this is exemplified by the story of Prof. Joseph, whose hand was chopped by the Islamic group for a question asked on Prophet Mohammad, amidst the students of his class room. The Muslim political outfit named Indian Union Muslim League (IULM) is a component of Kerala political fiesta and has been seen to have allegiance to the Congress led UPA at the centre prior to 2014. This party has a significant role to play in potentially polarizing the voters ahead of the impending elections. The state has als o acted as a crucible for the Communists to brew their sinister politics in the name of secularism. It is a known fact that Kerala has the largest numbers of political murders; particularly the right winged politicians, largest booze consumption, highest proportion of live-in relationships and largest number of mental ailments in any state. Swami Vivekananda had once termed the state as a mental asylum. This state bears the highest number of political strikes than that of any other state in India, whose ramification is visible in the size of diaspora that exists in the Gulf and Middle East. Among the five States to face peoples’ test in this year’s assembly elections, Kerala is also one. To challenge the alternate coalitions of Kerala, saffron politics have started flourishing in this Gods own country in the form of BJP and BDJS. 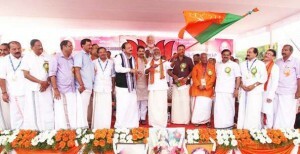 The effects of this were felt in the last Municipal elections held across the state, where BJP had emerged as the s econd largest party in the Capital’s Municipal Corporation of Thiruvanthapuram. To bridge the caste chasm, the leaders of the Ezhava community have incarnated themselves as a political party in the name of Bharat Dharma Jana Sena Party. The saffron uprising in Kerala is viewed as a beacon of hope, by those who were fed up with the alternate coalitions of UDF and LDF. It is hereby hoped that this state truly turns out to be God’s own Country after the assembly elections in 2016, where the people get benefited and prosperity of the state increases through the people’s participation.